Job – so much pain, so much suffering, so much loss. But he understood that there was a greater purpose. In the midst of it all, he could say with certainty that he knew that G-d saw him and he would emerge from his trials with all the impurities burned away. I have certainly not experienced the types of trials that Job had, or that so many others face on a daily basis, but we all have things that are “trials” for us. This verse has been one that I come back to over and over again in my adult life. Yes, adulting is hard! It only gets harder with each successive child added to the family, career advancement, and ministry responsibility. There is less and less down time and more and more needs to be met. It seems like a constant juggling act. I feel constantly under pressure – like a diamond. Sometimes I wonder when I will get a chance to breathe and recuperate. It is these times that I turn to my understanding of this verse. “But He knows the way that I take…” Job acknowledged that G-d wasn’t ignorant of his suffering. He is deeply “acquainted with grief” (Isaiah 53:3) – our grief, pain, stress, worry, anxiety, weariness. But G-d’s plan for us is to use these hard times to strengthen us, to burn away the weak parts. 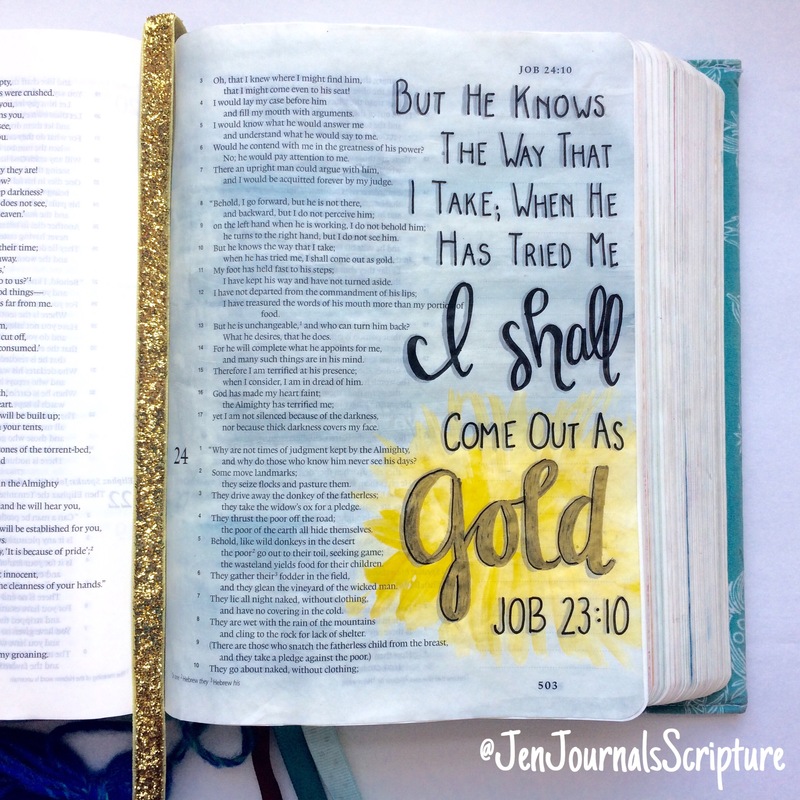 We have all heard sermons on how you have to burn gold to remove the impurities, yada, yada, yada. But did you know that heat strengthens metal? I’ve started watching this new tv show, Forged in Fire, where bladesmiths (that sounds so cool!) compete to create their blade of choice from unformed metal. Through a series of steps in the competition, they form the blade, refine the blade and attach the handle, and have the blade tested for strength and sharpness. A team of experts evaluates the blades at each step to eliminate one competitor. These experts also provide commentary as the bladesmiths are working. I’m absolutely fascinated by this show! If you weren’t absent that day in school, you know that you have to heat metal to make it soft, using a hammer and anvil to form it into a desired shape before the metal cools down again. The metal must be heated to extreme temperatures so that it is white hot and malleable. But the thing that I have learned from this show is that even after the blade has been hammered into the desired shape, it must be “heat treated” to completely harden the metal. If the blade isn’t heated to a hot enough temperature, sometimes several times, the blade will be “soft” which allows for the possibility that the blade could break or warp. After this heat treating is done to the bladesmith’s satisfaction, he “quenches” the blade, plunging it into a container of oil to stop the heating process and set the blade. This is our life. We are being put into the fire to soften us, melt away our exteriors of control and perfection. The trials of our lives are G-d’s hammer and anvil, shaping us into vessels, tools, and weapons for His glory. The constant process of heating and reheating is our own “heat treat” to set the shape that G-d has created. At certain times we will feel the “quench” where He plunges us into His holy oil – the presence of His Spirit – to cool us. But if we are to be effective, and not defective, we must remain in the fire with the promise of the strength and the gold to come.